Directed by : Marco Vicario. Produced by : Ugo Tucci, Marco Vicario. Screenplay by : Marco Vicario. Editing : Roberto Cinquini, Pedro Del Rey. Photography : Ennio Guarnieri. Music by : Armando Trovajoli. With : Rossana Podestà, Philippe Leroy, Gastone Moschin, Gabriele Tinti. 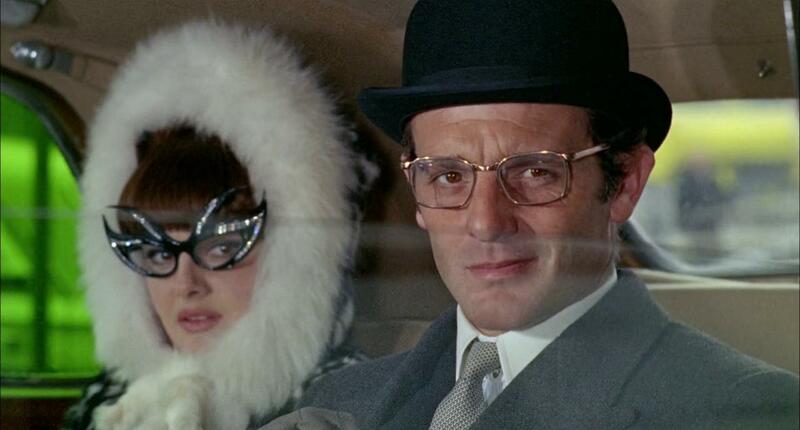 The « professor », a heist specialist, has decided to steal the Swiss National Bank with his fiancee and his team. 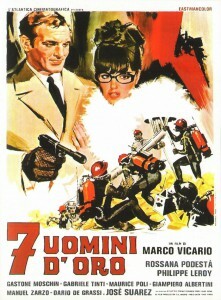 Unknown and yet prolific figure of Italian cinema, Marco Vicario began as an actor before shifting to production, writing and directing in 1964. His first film, The naked hours, is based upon a novel by Alberto Moravia and influenced by Antonioni’s cinema. A year later, he directs this pleasant remake of Jules Dassin’s Topkapi, with the faithful Rossana Podestà (The castle of terror) and Philippe Leroy (Femina ridens), with which he will team again for Seven golden men strike again!, a sequel released a year later.